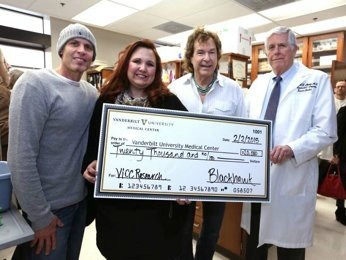 One of country music's most loved groups, BlackHawk, has once again raised funding for Nashville's Vanderbilt-Ingram Cancer Center on behalf of the Van Stephenson Memorial Cancer Research Fund. BlackHawk's two surviving founding members – Henry Paul and Dave Robbins – presented their annual donation to the hospital in honor of their third bandmate Van, who died from melanoma skin cancer in 2001. The latest donation brings their total to $100,000 raised for Vanderbilt-Ingram's research lab since 2006. “The funds that BlackHawk has raised and donated have made a real difference in our ability to accelerate research and provide better treatments for patients with malignant melanoma,” says Dr. Hal Moses, director of the Frances Williams Preston Research Laboratories at Vanderbilt-Ingram Cancer Center.